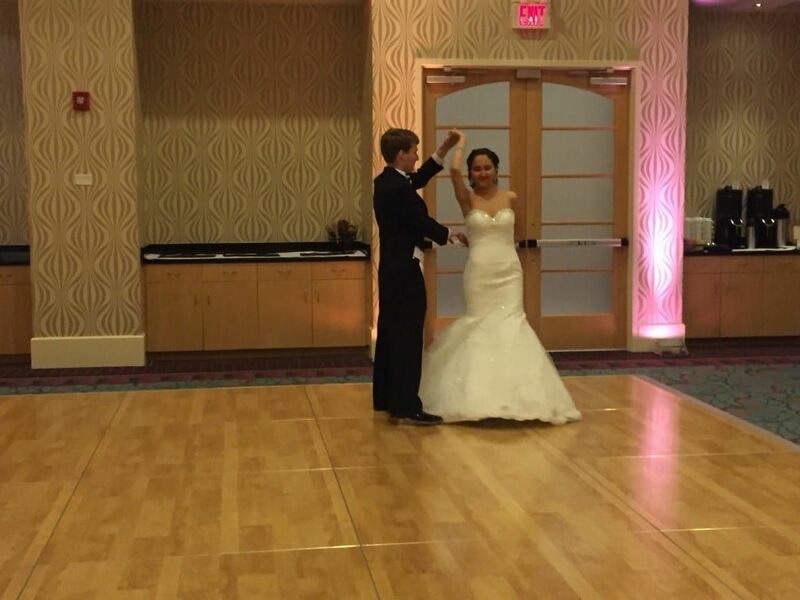 After the wedding ceremony at Holy Infant Catholic Church, the 70 guests made their way to Brier Creek’s Embassy Suites for Lina and Emerson’s Cocktail hour and reception. The cocktail hour was held in the hallway in front of the ballroom and I had a mix playing of rock, country and even some Latin music to honor Lina’s Colombian heritage. After photographer Griffin Davis got some shots, the wedding party headed over to the hotel and rested before being announced into the room that was decorated with floral arrangements by Tre Bella. The doors to the ballroom opened and I went to line the wedding party up with help from Embassy Suites’ Ashley. They entered to “Dynamite” by Taio Cruz and Lina & Emerson to “Everything” by Michael Buble. They came to the floor and had their choreographed first dance to “Lucky” by Jason Mraz and it was awesome! I could tell they practiced it alot. Lina then had a choreographed dance with her Father to “The Way You Look Tonight” by Frank Sinatra and Emerson escorted his Mother to the floor for their dance to “Forever Young” by Rod Stewart. Lina’s Father welcomed everyone and the salads and entrée’s came out. During dinner I continued the same mix as cocktails. After dinner we had a longest married couple dance to “Remember When” by Alan Jackson with the winners being at 51 years. I then opened the floor to everyone with some oldies, top 40 and 80’s that brought about half of the guests out to the floor. We paused after a while for the toasts and the Simply Cakes cake cutting to “Sugar” by Maroon 5 and then back to dancing to line dances, top 40, salsa, merengue and 80’s. We paused again shortly for the bouquet toss to “Single Ladies” and then back to dance music until the end of the night. After their last dance to “Save The Last Dance For Me” by Michael Buble, they had a bubble exit. What a sweet couple and great group to DJ for. Thank you Lina & Emerson and congratulations!